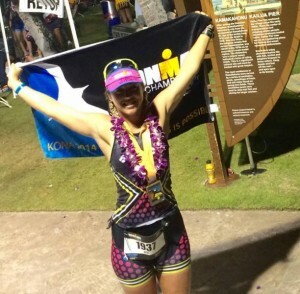 Athlete Lab Sydney member Debi Hazelden recently completed Ironman Kona on her way to topping her age group in the world Ironman rankings! Read her race diary to see how she got on below. 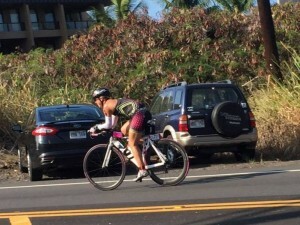 I JUST RACED KONA IRONMAN! It feels like a lifetime that I’ve been wanting to race on the Big Island. Like just yesterday I was watching endless videos of the Kona Ironman World Champs in the Athlete Lab in Sydney. My first Ironman was in Melbourne in 2013, followed by Cairns in 2013, IMNZ 2014, Cairns 2014 and Kona 2014! It was my chance to go experience the amazing race myself and I was super lucky to have family, friends supporing and lots of other friends racing. The first few days we swam the course, I did a couple of runs and cycles. The runs I found really hard in the heat. The swimming off the Kona pier was pretty amazing. Super clear with coral and cute fish. The coffee boat was out in the water a few days before the race, so we swam out and had a few too many coffees. The atmosphere was amazing. Athletes running and cycling everywhere. Everyone looks fit. Every bike looks fast. No-one runs with a shirt on. Everyone has abs and is super skinny – with muscles. People swim at the pier in the mornings, they give away free caps, chocolate milk, powerade, ART massages (which were awesome), showers with shampoo and condtioner. It’s all set up pretty well. Massive expos everywhere, aid stations down the road for runners. (bonkbreaker, endurance sports travel, training peaks etc). Nicole, Zoe and I drove out and rode the 2nd half of the bike course out to Hawi. There was hardly any wind and I was crossing my fingers for a day like this on race day. In the days leading up we did a couple of runs at the Energy Lab to test out how hot it would be. I was excited for race day!! I wasn’t even nervous. I’d heard lots about Kona and how hard it was. But in the weak leading up I was thinking it’d be ok. The winds were down (so I thought) Maybe it would just a bit hotter than my other Ironman races. Nothing prepared me for how it felt on race day! Leading into this race I’ve been feeling pretty strong on the bike, it’s always my best leg. Something I’d learned before Cairns Ironman where I rode a 5:14 was to include hill climbing to build strength and combine with my interval sessions at the Athlete Lab. The Athlete Lab sessions have definitely helped me to increase my threshold power output – I did an FTP test which showed an increase a month ago! Realising now how lucky I have been to have such quality training and such specific sessions right on my doorstep. To me I think the bike is always the most important leg to an Ironman. If you can ride well then you are fresher for the run. I can’t stress enough the importance of getting in consistent bike training for Ironman – for any newbies that want tips = that’s mine! But you must do both – interval sessions and hill sessions! So… see you back at the Athlete Lab again soon for post Kona recovery sessions, and soon IMNZ and Ultraman training interval #paincave sesssions! The days leading up to the race there was hardly any wind, but on race day the winds in the race were by far the worst I’ve ever ridden in. Everyone says Kona is hard but this was nuts!! Girls were getting blown off the road, it was crazy but I managed to stay upright. We went out into a headwind then turned around into a headwind!! Mike Riley said it was the windiest it’s been in 15 years, not that I’d know. But it was bloody windy! The lucky people that started earlier managed to get a tail wind back to town before the wind changed (pros, fast men and the faster female swimmers). I think I made the right choice of wheels – just before Kona I bought some Caden carbon wheels, a 38 front and 60 back which were perfect. After riding in a tough headwind out to Hawi I got to the 90km mark on the bike in 3 hours. I was pretty stuffed, I got off to go to the toilet. I’ve never gotten off the bike for anything in a race before! Not for special needs or anything. But I was welcoming a 2 min rest. I thought I’d be able to smash it back to T2 in 2.5 hours to at least get a 5:30 bike split. After 10km of downhill we went into another headwind the entire way back. Mentally it was pretty hard to know I was getting such a slow time, calculating I’d be back just over 6 hours. Off the bike in 6:02 and I had no idea how any friends were going. And first time for ages I nearly fell over when I tried to stand up and run in my cycle shoes after getting off the bike. I had to stop and take the shoes off. Running out of transition I saw the other girls just running (Zoe, Julie, Nicole) out too which was good for the mental state – knowing everyone had a bad time on the bike in those winds and that my time was actually ok. I’d managed to catch them up with a faster bike time after an avg swim. The run was where the spectators came out. They were lined up along Ali’i Drive. I got to see mum, dad, and had Kirsty run a bit with me in her jandals -“flip flops”. 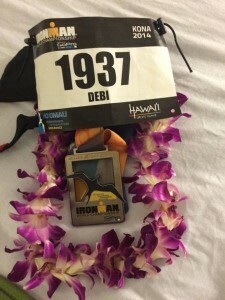 I went out slower than the other Ironman marathons I’d done. I thought I’d have to adjust my pace here compared to the other Ironman runs I’ve done. In Cairns I averaged 5:15 pace. Here I couldn’t hold it. I started at 5:30-5:45 pace. My plan changed after 13km on the run to finishing the race. It must have been the tough bike and the wind. I couldn’t hold this pace, I saw people walking everywhere and I wanted to walk. This was tough! I adapted my plan to running about 6min pace the 1.6km between aid stations and walking the aid stations to get the fluids in, ice, sponges, coke, electrolyte, water. Up Pilani hill, out to the Energy Lab. That was a long stretch, the music was pumping out there which was a big help. As I ran past they were playing Rick Astley “Never gonna give you up” for all you 80’s fans. I had to laugh and dance. Then as I’m heading back to town I see people just heading out starting to get handed glowsticks. I kinda want one… but am secretly glad not to have one. Loads were starting to walk, people dropping like flies, smashed after that ride. Loads of great athletes out there struggling on to the finish. But we all cheered each other on, encouraging each other. Everyone looking like they were hurting and in pain, dreaming of making it to the finish line. Only 10km to go… Supporters were cycling in the dark down the side of the road out to the energy lab. That was the part we needed support the most. It was an amazing atmosphere, music pumping and aid stations every 1.6km. I’m running between aid stations. I have 2 guys who are run walking ask me to join them. I don’t but we keep yo-yoing with each other and chatting. They run 3 cones then walk one. I can’t recall when I lost them but I think I passed them for the last time as I went for it coming down Pilani hill. I was so excited to turn off the highway. I picked up the pace knowing I only had 2km to go. So happy I had a massive grin. Everyone was screaming for me the last 2km it was amazing. I felt like I was running through air and I had loads of energy. Knowing I was finishing! Just like on the videos I’ve watched so many times! It felt pretty spectacular running down Ali-‘i Drive with people lined on either side screaming and cheering! I was so happy to finish!! I went straight to the massage tent after the race, felt like I was in another world watching down and listening to all the voices around me while I was on the table. Quite light headed and just damn happy. After the massage and food it was time to celebrate back at the hotel for a shower and champagne with Kirsty, mum, dad, Zoe and her mum. Then, down to pick up the bikes and stay at the finish line party till the end (12pm). It was like a massive party!! I absolutely loved the entire week and I’ll be definitely back! Massive thanks to the Athlete Lab, Kirsty, Emo, my mum and dad for coming over! And Zoe + family, Nic, Ian (aka Sebastian), Mel, Charlie, Jenny, Bec, Aaron, Pod, Edita, John, JC and Adam for making the holiday a great one! Next for me is the Fitz Challenge 250km ride with 5000m of climbing in Canberra on Oct 26th, (haha, who decided to sign up for that??) Sydney Ironman 70.3 Nov 30th, 320km Alpine Classic Audax in VIC in Jan, Ironman NZ in March and Ultraman in May! Active Recovery: The Importance of Rest Days Sprint Training!